There are many types of bifold closet doors that add visual appeal to any room. Awhile ago, the term bifold closet doors would conjure up images of one type of bifold doors with slats and flimsy knobs. Although these doors still may look great in other areas of the house, like a bathroom cabinet, they may not be sturdy enough to withstand everyday use like other, more solid bifold doors. 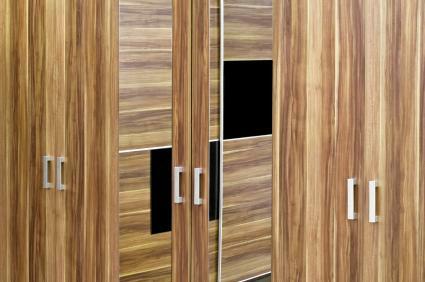 They are more visually appealing: These doors add an element of architectural interest to your room. Easier access: Since these doors open completely, you have easier access to all parts of closet. There are more choices: Bifold doors come in many different styles that make them much more appealing then you plain, flat run-of-the-mill hollow-core doors. Craftmaster Interior Doors: This site offers a wide range for designs for bifold doors. Interior Doors Direct: Take a look at the bifold doors from the very simple to the very intricate. Do it Best: Basic bifold doors that you can add your own finishing touches to. Choose doors with pre-drilled door knob holes. This saves you from the hassle of having to find the center of the door and drilling the hole yourself. Make sure your measurements are correct. Measure the closet opening twice to ensure that you buy the proper sized door. Always install the top track first. The top of the door jamb has a limited amount of space, so you will want to install this track first and then line up the bottom track. Check if the floor is leve. If your floor slopes, the bifold door will not slide properly in its tracks. You will want to level out your floor by using a planer (if the floor slopes up) or shims (if the floor slopes down). Trim out your door jamb. If the doors are too narrow to fit into the opening of your closet and you can't seem to find any other doors that fit, trim out your door opening with wood. This wood and be covered later with a little decorative trim and paint when you are finished installing your doors. Grease the tracks. The doors will glide easier if you grease the tracks a bit. Don't over-do it, though! You don't want a greasy mess in your closet when you are finished. Installing bifold doors is an easy weekend project if you are a seasoned home improvement do-it-yourselfer. If not, you may want to enlist the help of a friend or family member to make sure that your doors are hung properly because putting any kind of door up isn't as easy as it seems (which is probably true for most home improvement projects). Having someone else there to help you install your new bifold doors also makes it easier when lifting the doors into their tracks, especially if you have chosen solid hardwood doors or heavy mirrored doors. Finally, as always, take your time when installing your doors. This is especially important for closet doors that are heavily used like coat closets or shoe closets. If you rush the installation job, your beautiful bifold doors will eventually either fall off the hinges, not open and close completely or just plain fall apart.